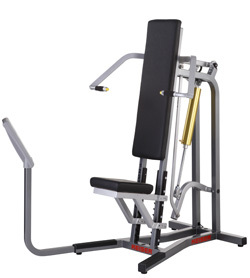 Keiser�s 250 Military Press features a seated position, giving the individual greater stability during this over-the-head exercise. The seat is fully adjustable to accommodate a wide range of users, and the seat back is designed to provide support for the lower back. The low starting resistance is ideal for deconditioned users and older adults.